Another day of moving east. We did some letterboxing in Kilgore, TX this morning, locating three letterboxes in a city park. 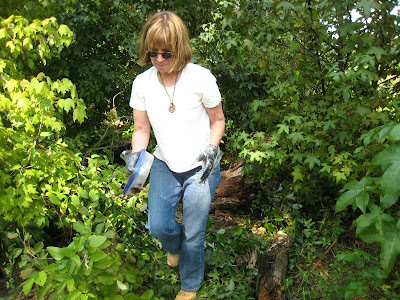 In the process, Dianne managed to lose her magnetic clip-on sunglasses. Then we faced the real test. Do we really have any talent for finding things?? Eureka! Found under a fallen pine limb. 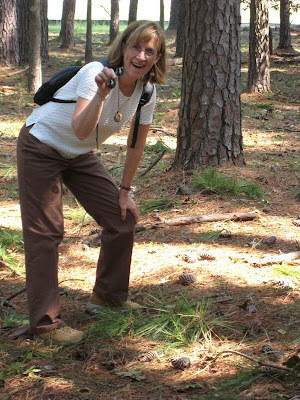 Letterboxing has taken us to some interesting spots we wouldn't have known about otherwise. 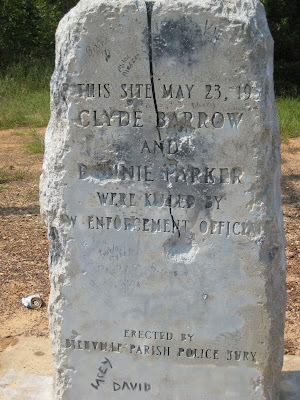 Today we visited Gibsland, Louisiana, where the infamous Bonnie and Clyde were killed in an ambush May 23, 1934, on a desolate road near their Bienville Parish hideout. Bonnie and Clyde were shot by a posse of Texas and Louisiana officers. According to deputies who were part of the posse: "Each of us six officers had a shotgun and an automatic rifle and pistols. We opened fire with the automatic rifles. They were emptied before the car got even with us. Then we used shotguns ... There was smoke coming from the car, and it looked like it was on fire. After shooting the shotguns, we emptied the pistols at the car... We kept shooting at the car even after it stopped. We weren't taking any chances." This stone marker, which looks as if many, many rounds have been fired at it also, stands at the site of the ambush. Each year the hamlet of Gibsland holds a Bonnie and Clyde festival. The town (population 1,119) has two Bonnie and Clyde museums, one of which formerly housed the restaurant where the pair ate their last meal. Just like the outlaws themselves, the "Ambush of Bonnie and Clyde" letterbox was challenging to find and a bit of a struggle to retrieve. No shots were fired, however, in the detection of this letterbox. Although we haven't been plagued by flies again, we encountered a different breed of insect when we entered Louisiana today--Plecia nearctica, also known as the lovebug. 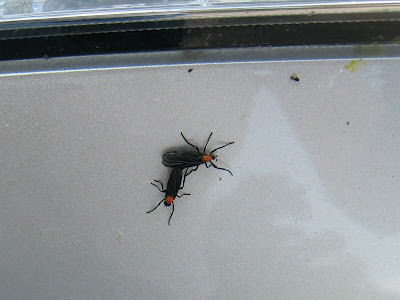 The bane of the Gulf Coast, the lovebug is a member of the march fly family. Most of the year these critters are beneficial little larvae, living in grassy areas and feeding on dead vegetation within the thatch left after grass is cut. Thus they help to release nutrients back into the soil and reduce excessive thatch. However, in their adult stage, they are a bit of a nuisance, flying in groups so large they look like clouds. Millions of these "double-headed bugs" lose their lives in late summer, ambushed by autos, trucks, and other vehicles across the south. 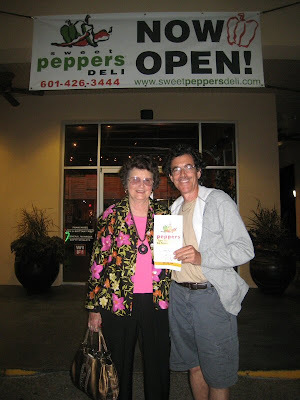 We finished the day in Laurel, Mississippi, enjoying dinner at the new Sweet Peppers restaurant (owned by Morris' grandson) and visiting Morris at the hospital.